2014 Turns 2015 and 28 Turns 29. Over the past few weeks, I've run into several acquaintances or clients who I haven't seen in at least a year, and each of those people brought up something they knew about my life or views on recent issues. Each of these opinions was solely informed by my presence on Twitter or NMC's blog/email newsletter. Luckily, none of these views were really misinformed, but it was a real reminder that people out there are paying attention to what you say online. This post is not meant to scare anyone from sharing online, but those instances were a reminder for me to truly believe what I put out there. Before you send out that tweet where you *hate* a company, person, or something else, make sure that's what you want others to know about you, because you're going to be informing their opinion and this medium could be the only way they're informed about you. If someone was pleasant the one time I met them, but they've been a jerk on Twitter for a full year, the latter will likely inform my opinion more than the former. There are sensationalized stories out there about how one viral tweet can ruin someone's life, but this idea is more focused on how sustained, non-viral tweets and posts shape perception. They do. Obviously, there's room for humor, hyperbole, etc., and I heartily embrace those techniques, but make sure others understand you're using them or don't make them a core of your persona unless you want them to be. These interactions haven't really changed how I engage online, but it did make me take pause and note whether I was presenting my true self or my troll self. It's worth doing every now and then. I just completed my first seven days of meditation and am feeling great about the practice. I'm not sure when I first got interested in the idea of meditation, but I think it was the wonderful documentary on George Harrison, Living In the Material World. However, while it was a key part of Harrison's life, it felt pretty intimidating from its portrayal in the film. Meditation subsequently came up with friends, some of whom even tried it, but I still abstained. Then, I've recently been thoroughly enjoying Tim Ferriss' podcast of interviews with creative leaders, and it's a recurring theme on there, and I finally decided to give it a fair try. It was probably a combination of the repeated mentions, understanding I could start with simple breathing meditation, aid of technology to get started, and recent feeling of busyness all combining that made me try it. To initiate the practice, I used the mobile app Calm and its beginner's 7 Days of Calm series. You're challenged to do a guided meditation for 10 minutes per day, each with a different theme or lesson for the day. I was pleasantly surprised that I immediately felt positive effects -- a certain lightness and...calm...washed over me after the very first day. After that, I continued to feel positive effects and ripples throughout my daily activities, and I'm excited to see where they go from here. Interestingly, perhaps the most refreshing part of meditation for me has been the total comfort and acceptance in making mistakes with the practice. You're actually doing something that our minds, especially lately, are innately wired to be bad at: undivided concentration on nothing. No one will be able to fully clear their mind on their first attempts, and it's stressed throughout the sessions that you're not to get frustrated at mistakes when your mind turns to other thoughts, daily checklists, etc. In today's world where we're instantly saddled with regret after sending an email with a typo or immediately criticized on Twitter for an ﻿opinion﻿, it's nice to do something where you're not only allowed to slip up, but fully expected to. It's just the beginning, and I need to stick with it, but consider me a big fan so far. I've already mentioned it to some friends and in perhaps today's truest test of belief given money to the app for an enhanced subscription. Go forth, give meditation a shot, feel liberatingly comfortable in not being good at it, and practice to get better. That's my plan at least. So, this post is two months late, but shame be damned, I still wanted to get something up. This is the second of my series of birthday posts where I look back at the previous year and toward the new one. Hopefully, this post has less typos than its predecessor or I may just need to give up writing. 2014 was a pretty jam packed year and was a unique experience in that it led me to both the highest of highs and toward the lowest of lows. Starting with the high, I got to marry Sarada! 15 months of engagement and planning culminated in a really spectatular wedding where we got to celebrate our journey together, our future, and our families and friends. I really couldn't have asked for a better day from the venue and guests to the perfect 75 degree weather. It was a blast. Sarada and I tried to soak in every moment while also keeping a focus on one another -- what a fitting way to kick off the rest of our lives together. The low was losing my original best buddy in the whole wide world, my grandpa, in November. Gramps was a pivotal influence in my life, and we had to say goodbye too soon. However, I'll always treasure all he taught and gave to me. Whether it was from a young age telling me to "never work for anyone else, Clay. Start your own thing." (a wish I've happily honored for the past nine years) or the way he taught me to treat others or stressing what a masterpiece of comedy Happy Gilmore is, I'll keep all of these things and more with me. I am really focusing on trying to remember these things from our most treasured times together rather than the sad last days, but it can be hard to separate the latter from the former at times. I hope to get better at it and remember him at his most vivacious, and I'm all ears if others have recommendations how to do that. Hearing House of Cards mention Dunbar Armored cars, where he worked for more than 25 years and rose to be their chief of operations, simultaneously brought the joy of remembering what he built and the defeating sadness of not being able to text or talk to him about it. I miss him and will alway miss him, but I hope to honor him just as much. Traveling up to NYC with Sarada for a long weekend and a cool Brooklyn wedding. It's always fun to see her back in her element in the city and have her show me around. I also got to have some great times with some UNC friends a few days before she got to town. Honeymooning in Belize! We left a week after our wedding for Ambergris Caye, a small island off the coast of Belize. We spent a week at the Victoria House and had an amazing time. Biking into town, a sunset sail that turned into a squall, snorkeling with giant sea turtles and sharks, catching our limit fishing for snapper, and much more -- it's a trip that deserves its own post (and will hopefully get one someday). It was a great honeymoon and a trip I would recommend to anyone. Spending a week in San Francisco and wine country with Mike, the best man at my wedding, and a host of other friends. I was out there for our friend's wedding and Mike was generous enough to take some time off work and spend a couple days in the Russian River valley in Sonoma with me, hitting up wineries, eating well, enjoying great conversation, and jamming to some lo-fi while driving along the coast. Then, Mike put me up in his home for the rest of the week while I worked from SF during the day and caught up with friends in the evenings. A New Orleans bachelor party. Anyone who knows me knows that I have a real love for New Orleans. The people, the music, the culture, the food, and the open container laws all just scream my name. A group of 17 of my best friends in the world descended upon the city for French Quarter Fest and had an absolute blast. I hope to get back soon, but if I don't, this was a good send off. A number of other small trips for weddings, bachelor parties, and more. Two that stand out are exploring both Austin and Asheville with Sarada, Joel, and Katie. A long weekend trip is often exactly what's needed to recharge and get a sense for another place. NMC continued to grow. We hired two new teammembers, beat our growth goal, and did our best work to date. It was a great year, and I am so thankful for the folks I get to work with. A pretty big year! I'm excited for the year to come; since we're already two months in I can say that it's on pace to be a good one. At a New Year's dinner with friends, one asked me if I had to place a "theme" on the coming year, what would it be? I thought about it for a little and felt like Routine would be a good thing to focus on. More reliably getting up early, regularly catching up with friends and co-workers, carving out time to read books, writing more consistently (ironic, I know), and more. Each of these are things that I do off and on when I have time, but building them into a consistent routine will pay dividends and help me be more comfortably productive...at least, I think it will! So, that's where the year's focus is. Hopefully you'll be seeing more writing here soon and cheers to 2015 and 29! Companies' transition to the mobile world seem to dominate news around their product announcements and earnings. Will that new messaging platform make the more mobile friendly? Is their design optimized to show people information (and ads) on mobile? How does the cost of an ad compare between the desktop version of the site and mobile? These are just a few of the questions that trail Facebook, Twitter, Google, and many others as they chart their path of dominance. One reason for these questions is the rapid growth in smart phones. 58% of Americans have a smartphone and it is very quickly becoming the primary way they interact with important online services. However, while the goal of being in front of your audience is a key driver of mobile adoption, so is the extreme targeting allowed by these ads. Below is a personal example that drove this point home to me. On July 4th, I went to Whole Foods to gather some party supplies for people coming over to celebrate and watch some fireworks. I did not check-in using any service, however, that didn't mean my phone didn't know where I was with its GPS system. While still in the store, I got a Push alert to my phone and email to my inbox, advertising $10 off $50 spent at the store. Alas, I didn't claim the deal, because I didn't check my phone while shopping. Catching someone in the moment or at least mindset has long been the goal of advertisers and mobile is letting them do that like never before. Imagine walking by a lunch restaurant and getting a Push alert that you can get free fries with a burger -- that would convince me to buy there. We're still in the early stages of this transition, but it's going to progress rapidly. Also, as consumers, it's important to understand that these type of ads coming directly into our life are the price we pay for all of these free services and for giving up personal information. Some may find that creepy, and it certainly can be. Advertisers will have to walk a thin line of not getting too personal, but I'm all for more Whole Foods savings when I'm in the store. Startups, especially funded ones, are known for trying tons of flashy marketing ideas to try and draw attention to their idea or product. Whether it's sponsoring expensive parties or hiring celebrity endorsers or spending lavishly on PR, the idea seems to be to make a big splash and get in front of as many people as possible right away. I'm not here to argue that these techniques have not worked for some people (Foursquare's SXSW unveiling was certainly a success), but a truly underrated startup marketing technique is the consistent email newsletter. I'm not just talking about email newsletter strategies for services firms, but also for social startups like Tumblr, Quora, Twitter, etc or product startups like Chubbies, Warby Parker, etc. It may not be the sexiest startup marketing tactic, but it works. Many have called email the original social network, and that's because of its effectiveness of tying together large groups of people and how it lends itself to passing around content, and that's why it's so effective for marketing. Email remains the stickiest app of all: we're all on it, checking often, and are likely to click through on compelling content. If you closely watch any successful social startup, they always seem to eventually start incorporating more and more email newsletters into their marketing. Twitter sends you the best tweets from your network in a given week, Tumblr sends weekly emails with the best posts from around the network, and it seems LinkedIn's online strategy is solely becoming emailing (spamming) posts from thought leaders. As an example from my life, email is probably the only way I interact with several startups like Quora; I'm sent content every week, and if I'm intrigued, I'll click through and read it -- by using an email newsletter, Quora converts me from someone who would never use the network to someone who racks up 3-5 pageviews per week. In addition to the immediate boost of getting me there, it also keeps the network top of mind and makes me more likely to randomly check it in the future or advocate it to others. Without that newsletter, I would've forgot about Quora years ago rather than being a weekly reader, casual upvoter, and very occasional contributor. Many startups think their startup may not be the best fit for a newsletter or they don't have the time to write one, but I'd challenge you to think through your options, and you can do it with an easy manual process of just inserting the best content into an email template. Some advice I recently gave to the founder of a website that lets you create and curate lists was to send out the most interesting lists each week to the network - for now, it didn't even need to be based on interest, just choose a nice variety. If you're a social-management tool like Buffer, blast out new features and also the most shared content. If you're a messaging app, let users know if other friends signed up this week and update them on new capabilities in the app. You're working hard on your company each week and users are interacting with your site or product each week; leverage the work going in on both sides by incorporating it into an email. It can be once a week or once per month, but I'm sure that any frequency will drive people back to the app. The big social networks and product companies have demonstrated they value email newsletters, and it's smart for startups to start prioritizing them, too. I recently read about Buffalo's new business plan competition to try and spur entrepreneurship in the area. It's called 43North and is offering $5 million in total prizes to businesses and a $1 million grand prize. With every municipality east of Silicon Valley undertaking "entrepreneurship initiatives," I'm usually a little skeptical, because they often seem to lack a real system in place and are just trying to capitalize on buzz; a city can launch as many Incubators as they want, but without a network of support, access to funding or mentors, and a community united behind the project, those spaces fail to really spur any true change in an area. However, after thinking about Buffalo's initiative some more, I think it's a really good idea. And that's coming from personal experience. 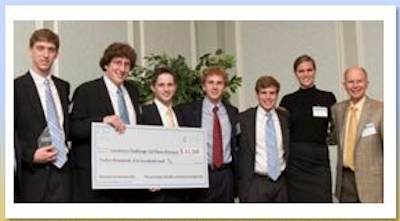 My partners and I launched NMC while still in college, and the motivating factor for the company was the Carolina Challenge, a business plan competition sponsored by UNC. We were lucky enough to win that competition and take home the $12,500 prize (essentially $1 million to a college student). I think I can safely say that without the Carolina Challenge, NMC wouldn't exist; however, interestingly, I do think it would exist even if we hadn't won the competition. That's the beauty of business plan competitions -- they dangle a carrot in front of you that encourages you to do a lot of the hard work up front. We had to spend a lot of time thinking about what we wanted to do, writing our business plan (which quickly got pitched out the window after a few months in business), validating that to judges, and making connections in the local business community as we traversed the competition. All of those things had to happen before we won or lost, and I distinctly remember all of us agreeing to act on our idea regardless of the final outcome, because of all the work we had already put in and the value we saw in it. Someone getting cheap space at an incubator doesn't necessarily have to go through all those steps, and it makes them less likely to be fully bought in when times get tough (and they will). And how did that investment from the community turn out? NMC is now 8 years old, employing a dozen people in the area, helping the local tax base, and contributing to the community in many ways (including fun windows). We're not Google or Facebook, but I'd say it worked out well for that relatively small investment, and we've also tried to pay it back to UNC by helping with the competition and speaking to entrepreneurship classes on campus. There are definitely plenty of ways to spur entrepreneurship in an area and many are cheaper than $5 million, but I really respect what Buffalo is doing and it seems to be outside the box of what most communities are trying (incubators, pitch days, etc.). It wouldn't surprise me if one of the biggest successes to ultimately come out of the process is someone who doesn't win the grand prize. I'm excited to see where this goes!